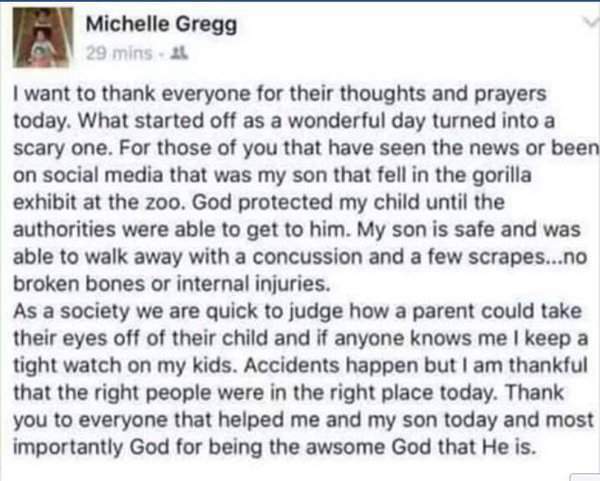 Michelle Gregg, the 32-year-old mother whose son fell into a gorilla enclosure at the Cincinnati Zoo last May 28 has decided to break her silence and fight back her critics. During the incident, Harambe, a 17-year-old silverback gorilla, was fatally shot by a zoo staff after the 400-pound ape was seen dragging the child at a quick speed across the water. After the video of the incident went viral, Gregg was highly criticized and blamed for the unfortunate turn of events. Several social media users and animal rights campaigners insisted that the critically endangered gorilla would have been alive if she kept an eye on her son. To air her side, Gregg wrote a lengthy Facebook post that was later deleted. “What started off as a wonderful day turned into a scary one. For those of you that have seen the news or been on social media that was my son that fell in the gorilla exhibit at the zoo. God protected my child until the authorities were able to get to him. My son is safe and was able to walk away with a concussion and a few scrapes… no broken bones or internal injuries,” Gregg wrote. “As a society we are quick to judge how a parent could take their eyes off of their child and if anyone knows me I keep a tight watch on my kids. Accidents happen but I am thankful that the right people were in the right place today.” she added. Deidre Lykins, a witness to the incident, came to Gregg’s defense saying that the latter was not negligent of her son in that particular situation. “This was an open exhibit! Which means the only thing separating you from the gorillas, is a 15 ish foot drop and a moat and some bushes! 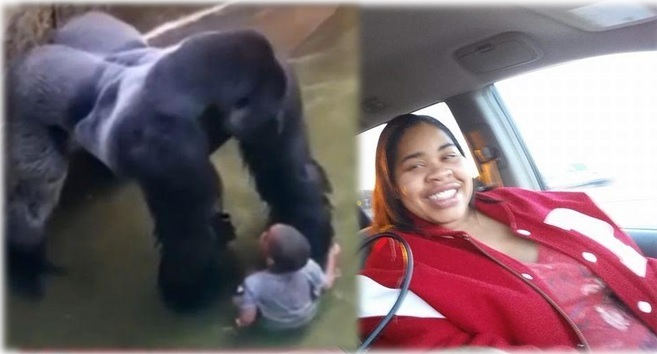 This mother was not negligent and the zoo did an awesome job handling the situation!” she wrote on Facebook. Meanwhile, a new footage showing how Harambe was allegedly protecting the boy moments before it was shot dead has emerged online. In the dramatic video, the boy is seen sitting calmly next to the gorilla. Harambe and the boy are even spotted briefly holding hands at one point. Several witnesses claim that Harambe was not displaying aggressive behavior towards the boy. Others believe that screams from visitors witnessing the tense situation caused the gorilla to panic and drag the child.